I headed out Saturday morning for Oregon. My landlord made me some banana bread (non-NYC people are just nicer). It was a gorgeous day and there was lots of new things to see along the way. The farmland in eastern Oregon is quite different from others I have seen in Ohio or the Midwest. There were lots of tractors and stacks of hay bales and so forth. A few cool looking run down barns and houses, but I didn't notice them in time to stop. When I stopped for gas in Burns, Oregon, I chatted with a man who said he moved every week for seven years! He recommended Flagstaff, AZ, as did the ski ticket saleswoman I met today who is from there. Mom says there is nothing there, but I have at least three other testimonials for its merits. 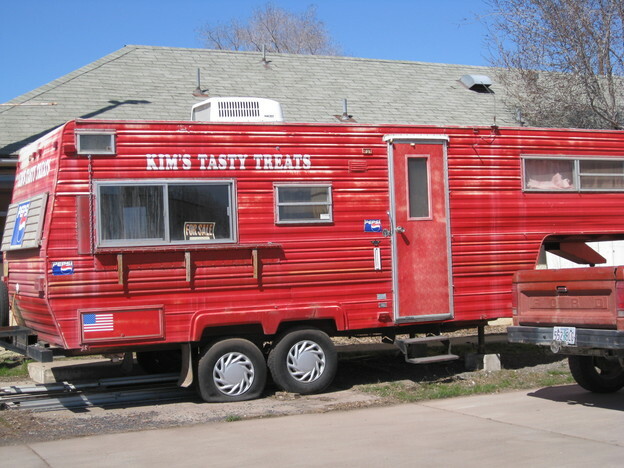 I think I will have to go check it out. 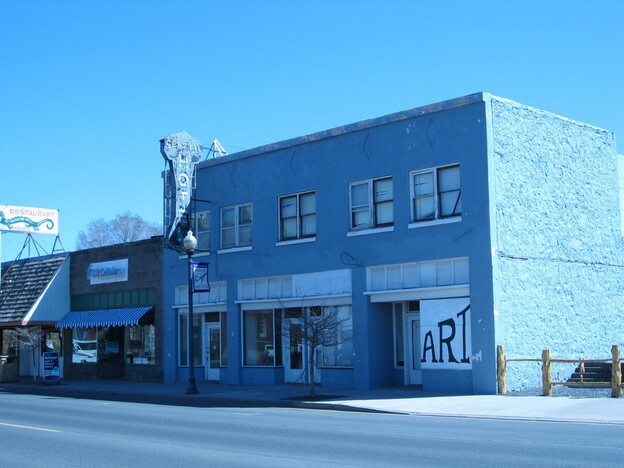 Burns, Oregon is a really interesting and weird town, so I walked around a bit and ate lunch a diner that has been converted into a Chinese food restaurant. 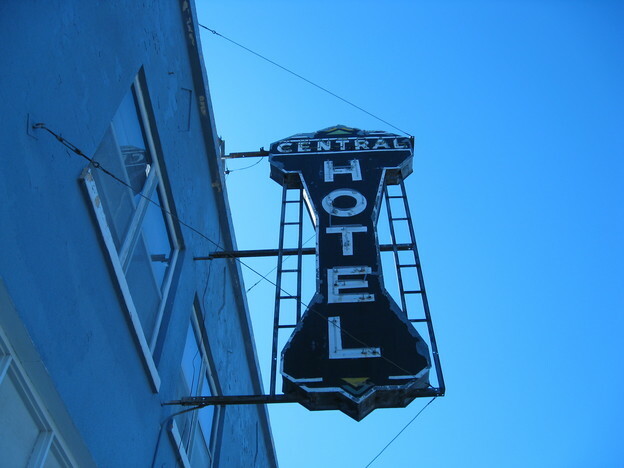 The Central Hotel building was particularly eye-catching. Not far from there I saw from the road a playground slide that was so awesome I had to pull over and try it. Sadly, slides just don't work that well for grown-ups. Our friction co-efficient must be off or something, so I wasn't able to get all the way down just on gravity. 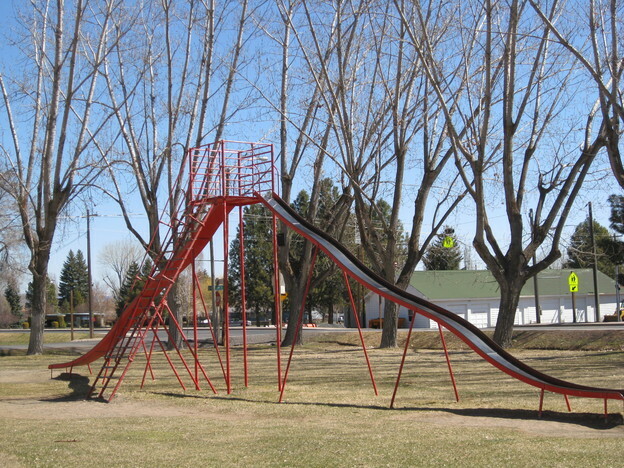 But both the slide and the dual ladders leading up to it were very cool. Across the street from the park was a building with a fire breathing dragon crest, the significance of which I was unable to determine. When I arrived in Bend I met my landlord Bob at the house. Bob is a friendly guy - a shirtless hippie, muscular, with very chapped lips and braces. He was still packing up some stuff and the cleaning lady was finishing up, so I took the green machine to a fund raiser car wash. The group doing the car wash is planning a trip to Mexico to "work with orphans". Then I explored the downtown area (thank you to the local government official who championed the big sign with arrows pointing to "Downtown" for us visitors). Drake Park is really nice. 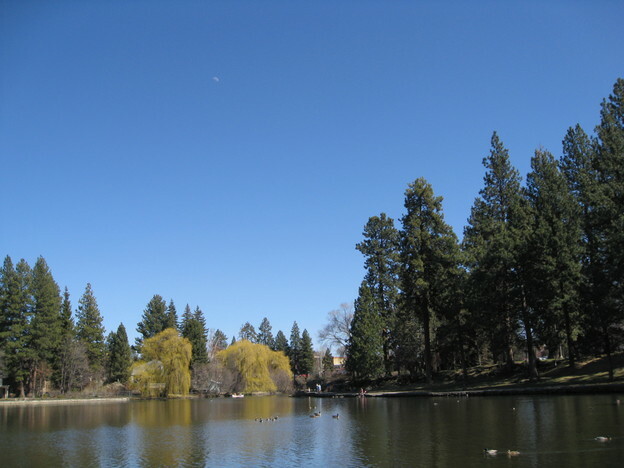 It is along the banks of the Deschutes River. I saw a funny mix of young punk rock kids, hippies in their twenties sporting dreadlocks, and lots of young families with two or three children, and everyone has a dog. The dogs were enjoying the weather, periodically venturing into the river to cool or and/or harass the geese and ducks. One large group of hippies was engaged in hacky sack, hula hoop, stilt walking, and some of them were apparently setting up a tight rope between two large tree trunks. Overall, the downtown is really nice. Lots of shops and restaurants, enough parking, lots of people strolling around, and a certain eery harmony between the various distinct social groups (the punk rock people really do look strange. I guess to them wearing the same thing you would wear to Ozzfest to a picnic in the park on a sunny Saturday afternoon seems obvious). This morning I left early to catch the shuttle bus to the nearby Mt Bachelor ski resort. I missed the 8:15 bus by a minute or so, so I decided to risk another mountain driving in a city car debacle and just drive there. 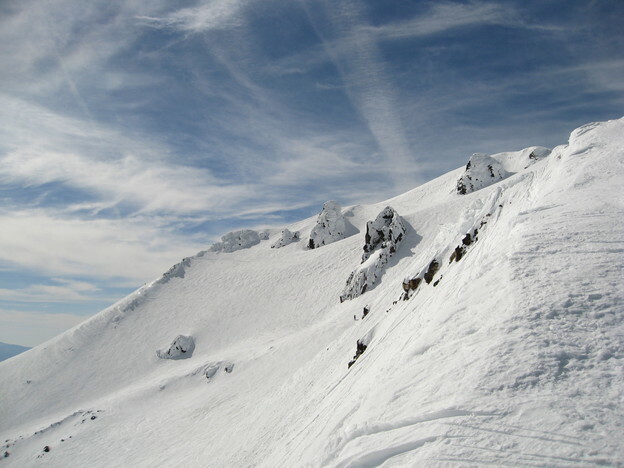 But Mt Bachelor is actually extremely accessible. No snow, never really that steep, and no sharp curves. So I bought a $99 pass for the rest of the season and went skiing. I had never done Spring skiing before. So now that I've skied on snow that is rapidly changing from ice to slush throughout the day, I think the only condition I have yet to ski in is really deep powder (Deep deep pow pow in official jargon. I have really only experienced pow pow with a singled deep). 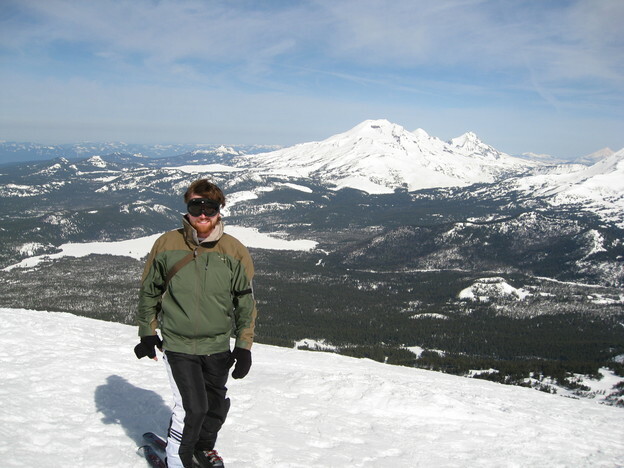 The views from Mt Bachelor are great and before long I abonded my hat and gloves altogether. I skied a pretty full day, but by around two in the afternoon the snow is so sticky that as you change speeds you run serious risk of your skis just suddenly stopping dead in their tracks while the top half of your body careens forward. So I headed out. On my way out of the parking lot a guy with a snowboard was thumbing for a ride. Now, after my experience both not picking up and picking up hitchhikers in Hawaii, I am generally of the opinion that hitchhikers in the continental US are to be ignored. However, wanting to meet locals and figuring taking someone from a ski resort back to town has got to be a pretty safe bet, I picked him up. And as I would have bet, he was actually not a psychopath axe murderer. He told me we could probably expect at least four more powder days this season, which was great news. He also explained some of the mountain to me for next time. Not content to stuff my feet into just a single type of awkward and uncomfortable footwear all day, when I got home I headed to the local climbing gym, got my month pass, and climbed a bit. It's mostly bouldering and the non-climbing gym equipment is a bit lacking, but it'll do nicely.